Breast Cancer? But Doctor....I hate pink! : The Assertive Cancer Patient - Help Her Live! If you make the rounds of the breast cancer blogs, you might know about Jeanne Sather and the 13 years she's been living with metastatic cancer. 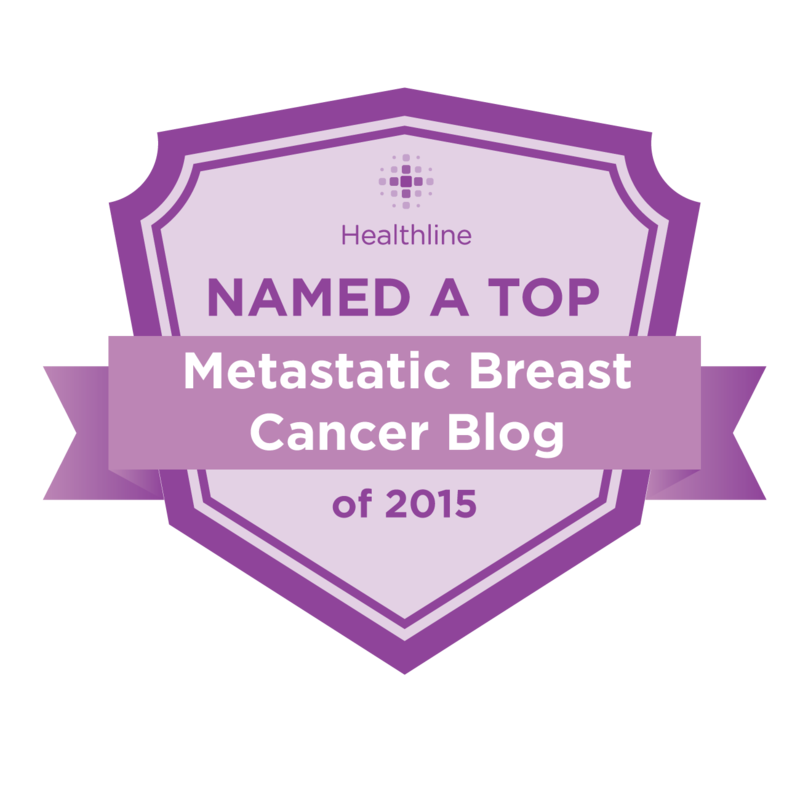 If you don't, she has blogged about her experience in the Assertive Cancer Patient. Jeanne and I have been in contact, off and on. We share a dislike of Pink October and emailed about that some time ago. And, now that I am likely facing my own metastatic diagnosis, I contacted her again, and Jeanne has been more than kind in helping me understand what may come. I didn't realize this until recently, but Jeanne, who like me is HER2+, is on the TDM1 trial. For those not in the know, TDM1 is nicknamed "Super Herceptin." It is showing remarkable promise for those women with intractable cancers who have failed on other treatments and who don't have much hope left. How remarkable? Last time I checked in with Jeanne, she was simplifying her life and was preparing for a friend to move in with her to help her die. She was at that point where she was done with treatment. She had cancer everywhere and was ready to go. She had months left, not years. It's a long story and you can read it on her blog. But, she needs help, and I'm asking you to help her. Jeanne lives in the Pacific Northwest. The TDM1 trail is in California. This woman, who hasn't worked for years due to her illness, (although she makes jewelry to sell) has to come up with the funds to travel to California each month, stay in a hotel and get her treatment. If she doesn't get the drugs, her cancer comes back. Pure and simple. This travel is not cheap. How often do you get to help save a woman's life? How often do you directly get to help keep somebody alive? How often are you called on to be a good Samaritan? Not very often, and not for a reason like this. Please head on over and donate to Jeanne. Anything you donate will be matched by a friend of hers - this is to encourage the smaller donations. Don't think you don't have enough. If you can give $5.00, $10.00, $20,00 or more - it will all go to help Jeanne. It all adds up. Talk about good karma points! And, don't forget, Jeanne is doing good for women with HER2+ intractable cancer. She is proving that this medicine works and works well, and her efforts will get this drug to market so all can access it. Once again, you're sharing some very amazing and useful information! I've made my little donation to get this woman down here for her Super Herceptin! That is absolutely AWESOME. I am heading over to donate this afternoon - we can't afford it, but she can't afford it if we don't, so we'll give a bit! Just think - if everyone who read any breast cancer blog online today gave five dollars - how much she could have to work with. Don't you wish we could set up a monthly drive to throw five dollars into a pot and give it to someone in Jeanne's shoes? What a difference we could all make, for five dollars a month, each. Thank you, Ann. And thank you to your readers! Hi. I am so happy to help with a donation, and wrote a blog post here about it as well, linking to this post. Best wishes to Jeanne! I've followed your blog for goodness knows how long, and follow you on fb (BreastCancer Karen) but for some reason had missed this one...found it on google whilst searching for tdm1 side effects. I'm already on the tdm1 trial but unfortunately didn't get picked for it and was selected for the my physicians/oncologists choice which was Eribulin. First 2 cycles were fab and lesions I'm my liver had deduce by half in size (blooming amazing) since then the cancer has been stable. The downside has been the amount of side effects that got worse with each dose and of late each day. I am at the point of wanting it all to end. Have prayed for my grandad who passed away 7ys ago to come and take me in my sleep but them been so gutted that I woke up spent the morning crying. I know its a fight but my fight has gone and have canceled my eribulin treatment .... I will be starting the TDM1 in December and your friend as given me so much hope that I will be able to walk, get out and be in the fresh air.